You can view detailed information about a concept and its various associated components (e.g. descriptions, relationships, and reference set members). You can make changes to a concept (e.g. adding another clinical phrase to describe the concept, retiring a concept or description). 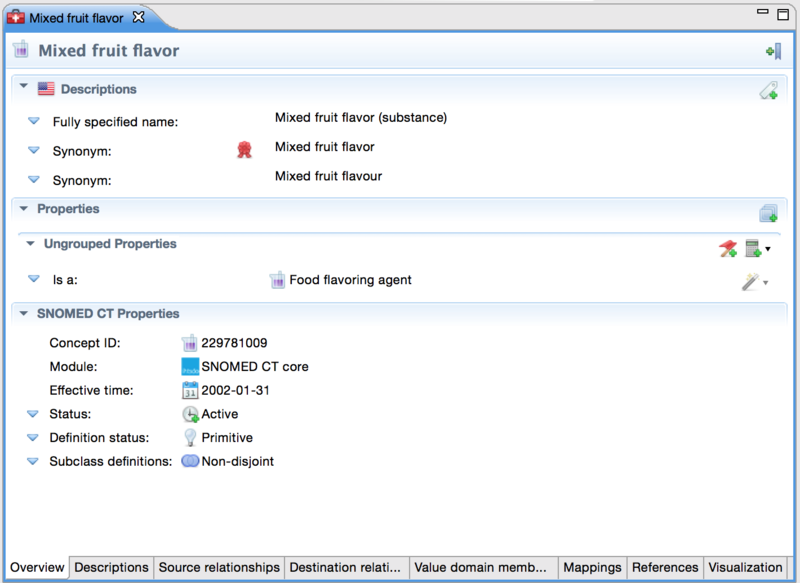 The title of the editor shows the preferred term of a concept (here: Fruit flavor). The concept editor displays information on a series of pages that can be selected by clicking the tabs in the bottom. After making a change, an asterisk (*) will appear next to the editor's title, indicating that you have unsaved changes. Click on the Save button in the main toolbar to submit your changes to the repository. Before the changes are saved, a dialog will prompt you to enter a comment describing your change. Quick search list: Click a highlighted concept in the list of quick search results. Editors: In most cases, you can double-click a concept that is displayed in an editor (e.g. reference set editor, task editor) to open its concept editor. If multiple concepts are open at the same time as in the example below, they appear as tabs, making it easy to switch from one to another. You can move tabs around to change the order by clicking and dragging. If the space is too small to display all tabs, the >> symbol will indicate the number of hidden editor tabs (here: >>1 symbolizing one hidden editor tab). Clicking the symbol will display a drop-down box with the other open concepts editors to pick from. The Add bookmark toggle button in the upper right corner of the editor: clicking the button will bookmark the concept, clicking it again will remove the bookmark from the concept. Bookmarked concepts can be viewed by activating the Bookmarks view. Tip: If you hover the cursor over one of the descriptions a tooltip with additional details will be displayed. This feature is also available in the properties section. Error, warning, and informational messages are displayed at the top of the concept editor. Clicking the hyperlink displays the messages, you can click on one of the messages to jump to this point in the concept editor. Unpublished changes are indicated by displaying a box around their entry. 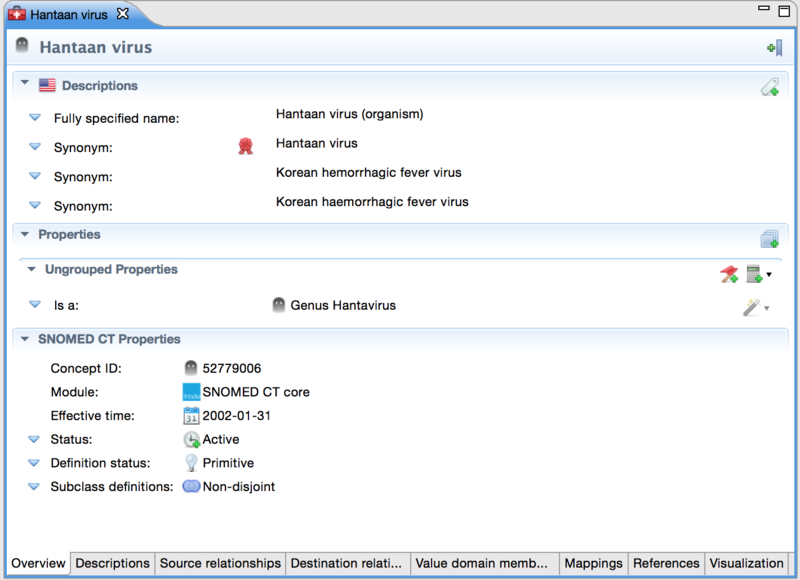 In the example below, the synonym "Hantavirus" is unpublished. Once you create a version for publication, only the text appears, as below. For more information about versioning please refer to the chapter in the User Guide.